Registration closes on Saturday, March 9, 2019. Coaches will conduct their drafts and contact players the week of March 17th. Please contact Jim Russell at with questions or concerns. 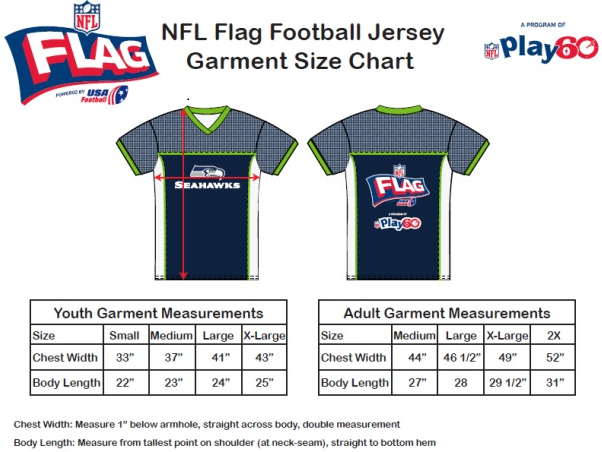 Each registered participant will receive an official NFL Flag Football Jersey. Please view the chart below to choose the correct size. Once shirts are ordered, they can not be returned or exchanged. Please remind your family and friends about registration. If this is your first season with this league, please make sure you submit proof of age via email or fax to 317-853-3139. PO Box 526, Avondale, PA 19311. Proof of age is required prior to the start of the season.